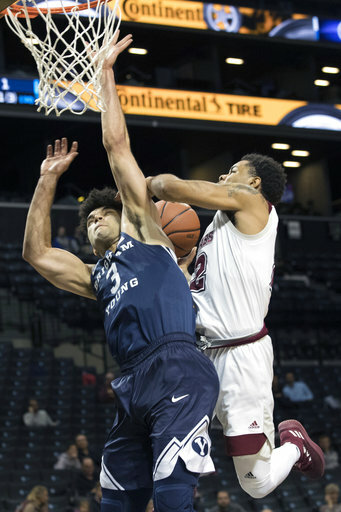 BROOKLYN, N.Y. – BYU men’s basketball came back from a 12-point deficit to edge past UMass 68-66 Saturday afternoon in the Cougars’ final game of the Barclays Center Classic. Yoeli Childs earned his third double-double of the season with 19 points and 11 rebounds while adding five assists, four blocks and two steals. Elijah Bryant and Jashire Hardnett added 18 and 10 points, respectively. Payton Dastrup had one of his best games as a Cougar, pitching in four points, five boards, two assists, two blocks and one steal. After UMass shot 56.5 percent in the first half, BYU held the Minutemen to 34.5 percent in the second. The Cougars outrebounded UMass 43-31. Down by 10 points with 4:44 left to play, the Cougars went on an 11-0 run with contributions from Hardnett, Dastrup, Childs and Bryant. A 3-pointer from Bryant brought BYU within one, 61-60, and his perfect trip to the charity stripe with 1:55 on the clock gave the Cougars their first lead 62-61 since midway through the first half. The lead changed hands twice more before the Cougars jumped ahead 66-63 on a pair of free throws by Hardnett. Rashaan Holloway then completed a three-point play for UMass with 13 seconds to go, tying the score at 66-all. After a timeout, Hardnett drove left and connected with an open Childs who dunked to solidify BYU’s win 68-66 with four seconds left. To open the game, Childs sparked the Cougar effort with nine unanswered points on a 3-pointer and back-to-back-to-back jumpers to go up 9-0 with 16:31 on the clock. The Minutemen then went on a 10-2 run to trail by one, 11-10, midway through the first half. UMass took its first lead of the game, 18-17, midway through the half. A 3-pointer from Zac Seljaas brought BYU within one, 21-20, but the Minutemen extended their lead to as many as 12 before taking a 10-point advantage at the half, 38-28. BYU opened the second half on a 10-4 run to swing the momentum its way. Bryant hit a 3 and put a transition layup in to cut the deficit to four, 42-38 with 15:37 on the clock. UMass steadily built its lead back up to 10 before the Cougars fought back with their late offensive push. BYU will play at Utah Valley in the UCCU Crosstown Clash on Wednesday, Nov. 29 at 7 p.m. MST. The game will be televised on BYUtv and radio broadcasts can be found on BYU Radio – Sirius XM 143, the BYU Sports Network and KSL 1160 AM/102.7 FM.